Our Sea kayaking adventure allows us to explore wildlife and nature up close. 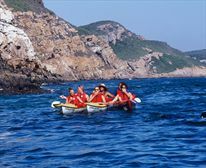 Experience the fun and adventure of Sea Kayaking. 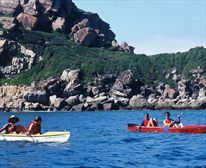 Whether your interest is wildlife, sea kayaking, or exploration, enjoy your adventure with Dolphin Adventures. 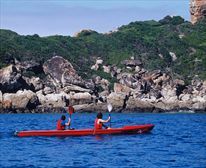 Sea kayaking is the way to get away from the crowds and offers the opportunity to see Plett's wildlife up close. The excursion starts when you get kitted out in your rush vest, booties, wet suit shorts and life jacket (all equipment supplied). 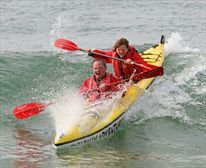 At the beach, select your brightly-coloured surf ski - a specific type of kayak used for ocean paddling. Specially designed, extra-stable boats are available for those who have never paddled before. Your guide will brief you on what to expect and give you a short safety talk. Then it's over to you, as you drag your craft down to the water's edge and climb in. The guides will launch you into the surf. You'll soon get the feel of paddling while traversing the swells. Mackerel and other small fish leap from the sea across the bows of your surf ski - occasionally they land inside. Dolphins soon join in, swimming around you and sometimes racing one another or leaping across the surface of the sea. Young seals may frolic beside your boat. 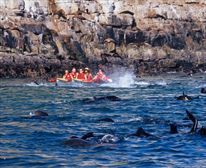 Depending on the wind direction, you will either paddle out to see the seal colony at the base of the cliffs on Robberg Peninsula or head east, towards the Keurbooms River and lagoon. Take in amazing views of the town from the sea; at Keurbooms, enjoy vistas of rolling green hills inland. This excursion lasts about 2 hours and your guides will accompany you all the way. Light refreshments (bottled water and apples) are provided to give you energy while you enjoy this wonderful activity. Trips take a maximum of 16 people at a time and no previous paddling experience is necessary. 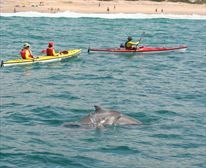 Dolphin Adventures is one of the few kayaking operators to take children under 12 - but remember that kiddies must be accompanied by an adult in the boat. Duration: Approx 2 � - 2 hours (Trip times can vary slightly due to traveling distances etc). Departure Times: 9:00am / 12:00pm / 15:00pm. All kayak gear is provided and safe lock up facilities for your valuables. Rate per person. Duration is Approx2 � - 2 hours (Trip times can vary slightly due to traveling distances etc).